Janesville, WI -- Phyllis M. Luebke passed away March 30, 2019 at the home of her loving son, Kenneth C. Luebke and his wife, Maria. Phyllis was born April 9, 1929 in Janesville WI to the late Phillip S. Scholl and Susie M. (Wilson) Scholl. 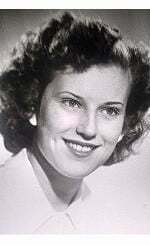 She graduated from Whitewater High School, and later married Robert A. Luebke Sr. She loved baking, donating cakes to Janesville VFW, traveling, and being outdoors. She is survived by her three children: Kathleen M. (Luebke) Copeland, Robert A. Luebke Jr., Kenneth C. (Maria) Luebke; seven grandchildren; and twelve great-grandchildren. She was preceded in death by her parents; sister, Genevieve; infant brother, Phillip; and loving husband, Robert. Phyllis requested no memorial service or funeral.